I recently read that many students in a country in Europe dorm where asbestos was present without even knowing. The university did not tell their students there are materials that contain asbestos because the materials are low risked. It is something scary for students to not have known that they were at school sleeping in a area that might contain asbestos. The university is taking care of the situation and whether there is a low risk, the institution should informed their students. When materials that contain asbestos are disturbed fibers can be present in the air and if inhaled pose serious health risks. Before any renovation and if you have doubts whether your home contain asbestos materials seek a professional. You can't tell sometimes if materials have asbestos just by looking at it unless it is labeled.Asbestos might have been mixed with other materials and substances. If in doubt, treat the material as if it did have asbestos and call a professional who will analyze and sample the material that might contain asbestos.If asbestos is present the inspector will provide a written evaluation and location where asbestos is located and give recommendations of hiring an asbestos abatement contractor and also give you recommendation prevention tips. When asbestos is properly handled, problems can be prevented in your home and can protect the health of yourself and your family. 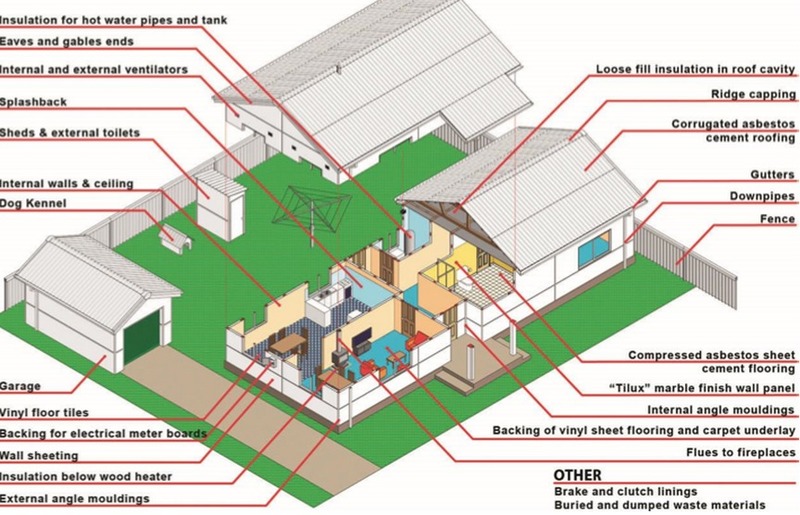 The image above shows places where asbestos can be found in the home. It is important to seek professional assistance if there is asbestos in your environment. Alliance Environmental is a licensed asbestos removal company with extensive experience in properly containing the asbestos, complete decontamination of the site, and lawful disposal of the contaminated materials.